My name is Dr. Wassil Nowicky, from Vienna, Austria. I was informed today that Israel is preparing my physical liquidation again, that is planned on the 8th, 9th or 10th of February this year. I feel it's my duty to inform you about thissituation. As you can see from the book of Dr. Eleonore Thun-Hohenstein “Cancer can be successfully treated. 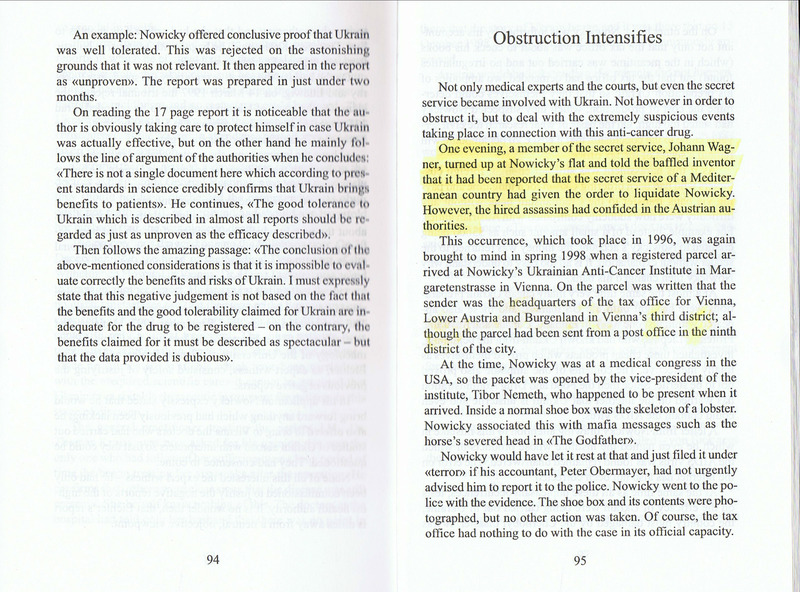 A history of obstruction” (http://www.ukrin.com/en/book), for the first time it was planned in 1996: “…One evening, a member of the secret service, Johann Wagner, turned up at Nowicky’s flat and told the baffled inventor that it had been reported that the secret service of a Mediterranean country had given the order to liquidate Nowicky. However, the hired assassins had confided in the Austrian authorities…” (http://ukrin.com/docs/p_95_liquidation.jpg) (note: Mediterranean country means Israel). I became the founder of a new mode of therapy called proton therapy and many scientists all over the world are devoting themselves to this promising approach. As a result I am being invited to many international specialist congresses: in Dubai,UAE (Honorable Guest),San Francisco, USA(Key Note Speaker), Baltimore, USA(Honorable Speaker),Paris,France(Organizing Committee Member and Keynote Speaker), Osaka, Japan(Honorable Organizing Committee Member and Keynote Speaker), Sydney, Australia (Honorable Organizing Committee Member) (http://ukrin.com/docs/CONGRESSES_2015-2018.pdf). I has developed the medical preparation against cancer with a selective effect on basis of celandine alkaloids NSC631570 (Ukrain) (in therapeutic dosage it kills only cancer cells without damaging healthy cells). The preparation consists of starting substances that were already registered — greater celandine alkaloids and Thiotepa (http://ukrin.com/en/efficacy). This preparation caused “total remissions that have already lasted for several years (up to 10 years)” in one part of 400 case histories of patients who had exhausted all forms of conventional treatment. It was stated by the Austrian Ministry of Health(GZ 21.405/1011-II/1/8/92, by the Medicines Advisory Board signed by Prof. Dr.G.Hitzenberger and department head Dr.G.Liebeswar) (Abschlussgutachten gem. para 34 AMG (August 1992), GZ 21.405/1011-II/1/8/92—http://www.ukrin.com/docs/Zitate_Abschlussgutachten_1992.pdf). These facts enable us to declare that cancer can be treated. I was nominated for a Nobel Prize 4 times (an article “Metamorphosis with the Nobel Prize” — http://ukrin.com/docs/nobel_universum_eng.pdf). In 2017 there were 2 candidates for the Nobel Prizes in chemistry: me and a group of scientists who finally were awarded: Jacques Dubochet, Joachim Frank and Richard Henderson "for developing cryo-electron microscopy for the high-resolution structure determination of biomolecules in solution”. Apparently, what seems to be more important for human life: cryo-electron microscopy or anticancer drug? If I was awarded a Nobel Prize nobody would dare to organize my physical liquidation. P.S. 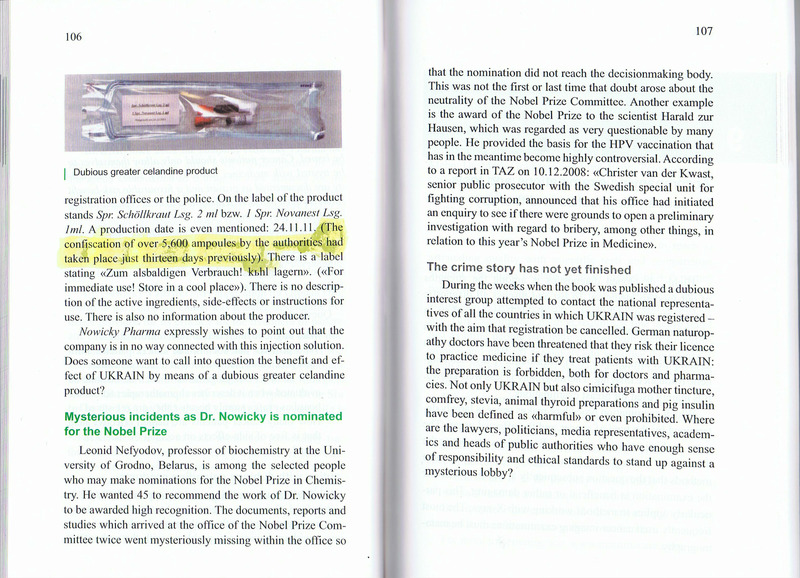 Perhaps, this information will give you the answer (http://ukrin.com/docs/p_106_ampoules.jpg— page 106, Dr. Monika Berthold, Elisabeth Buchner “Curing cancer without side-effects. The incredible success story of medical product UKRAIN” — https://www.amazon.com/Curing-Cancer-without-Side-Effects-astonishing-ebook/dp/B01ACATSDC).